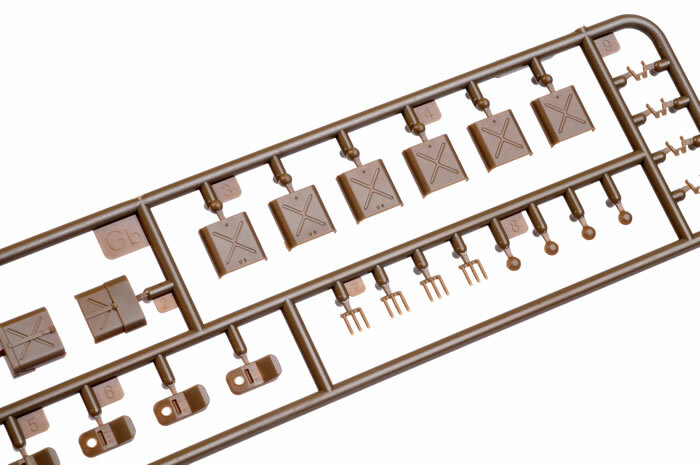 Contents: Around 200 parts in brown plastic; five parts in clear; 100 parts on one photo-etched fret; decals; three figures in grey plastic. 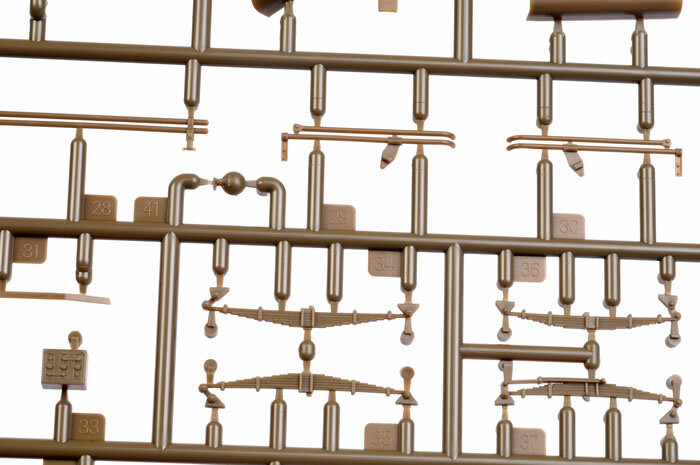 Advantages: Superb detail; high quality moulding; specific variant not offered before; many useful options and additions incuding trailer and three figures. Recommendation: Highly Recommended for experienced modellers. 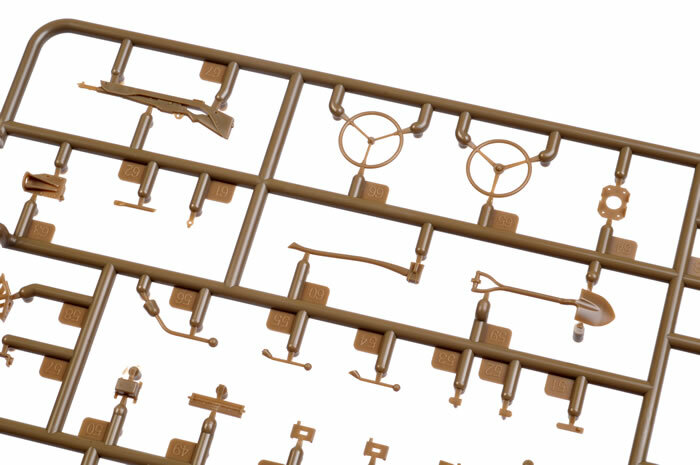 The best detailed Jeep kit currently available, and with the most options. Build a better mousetrap and the world will beat a part to your door. Never, has a more apt description defined this new kit from Bronco. 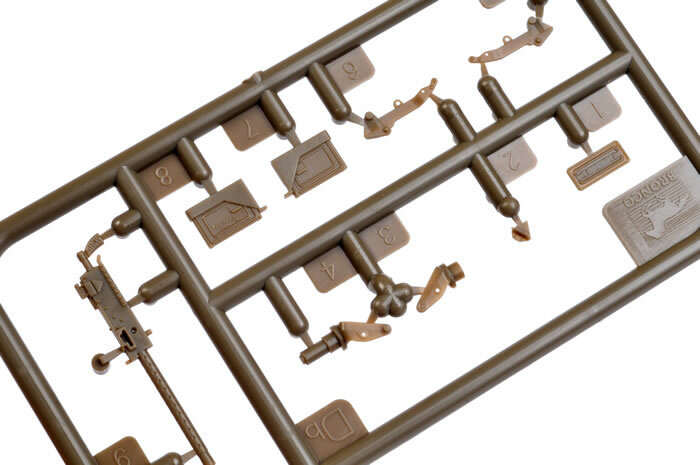 When Tamiya released its second rendition of their Jeep kit in 1997 the modelling world was stunned at Tamiya’s moulding prowess that, many (including myself) could not conceive that this kit might be bettered. The lower body moulding with its integrated sidewall and grill was a masterstroke. With this in mind, any new kit of this type would have to include some pretty nifty details to improve upon an already great kit. 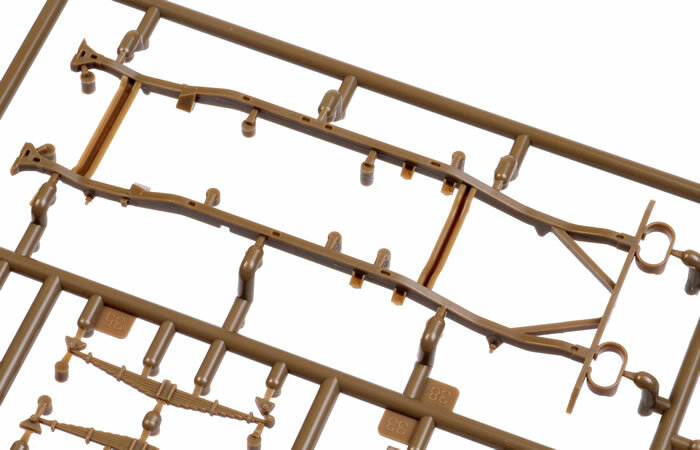 I can report that, nearly 15 years after the Tamiya Jeep release, Bronco has succeeded and this new kit is indeed an improvement in terms of detail and options. 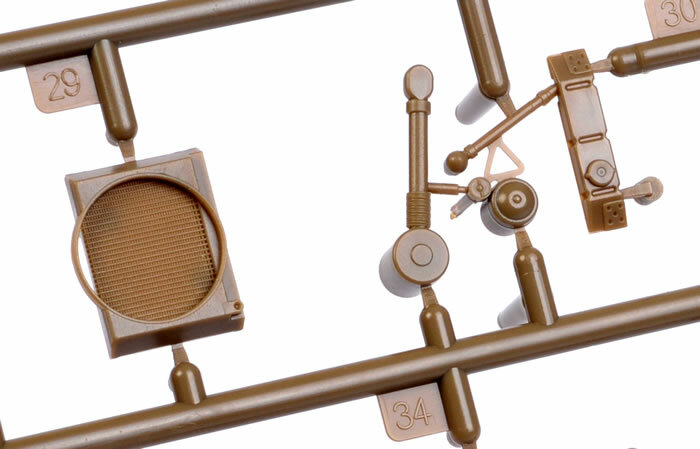 This new kit from Bronco represents the 1942 Ford production variant that differed from the earlier versions by the inclusion of minor fittings. The most noticeable of these was the front frame cross-member under the grill. 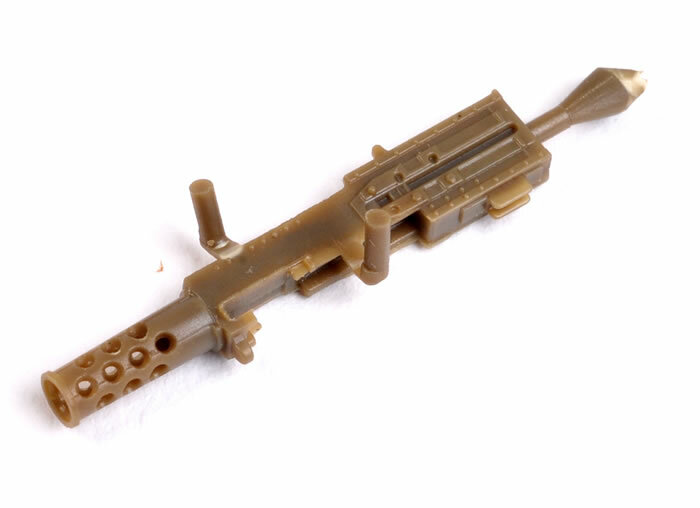 On the Willys MB, a tubular piece was used, while an inverted "U" was used on the GPW. The other noticeable difference was on the lids for the toolboxes located on either side of the rear seat. 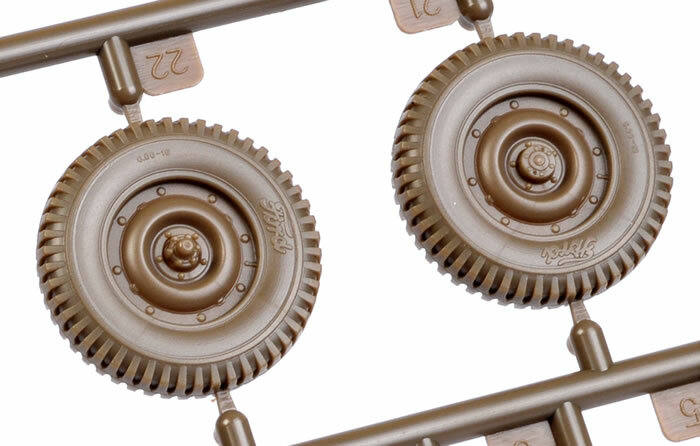 The Willys MB uses a plain flat cover whereas the Ford GPW has an embossed lid. 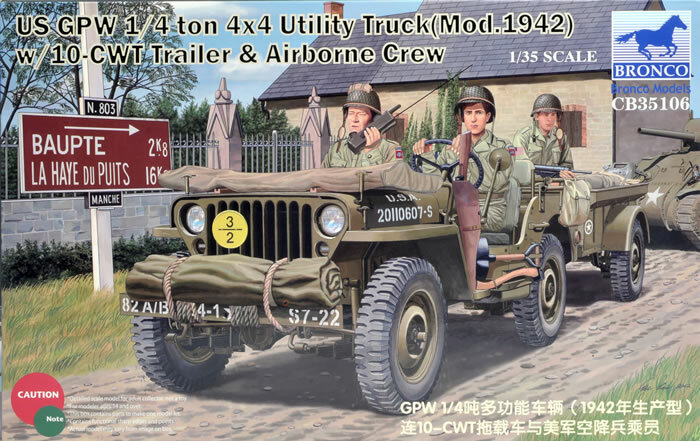 Care should also be taken as only the first few thousand Ford Jeeps included the stamped Ford logo on the rear plate as depicted in the kit so consulting your references is advisable. 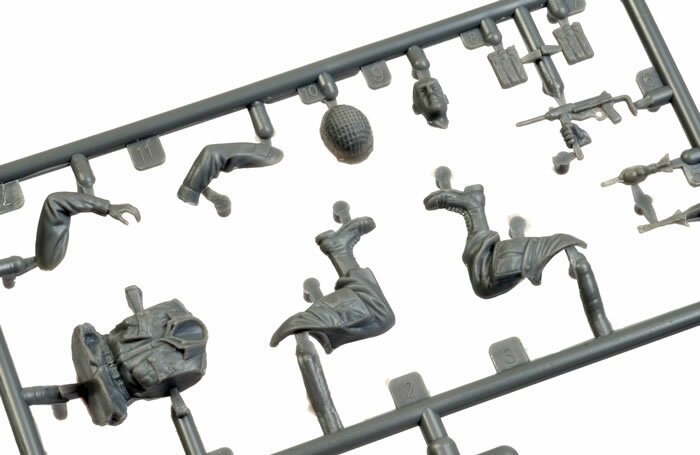 These differences are welcome, as they distinguish it from the Tamiya offering. 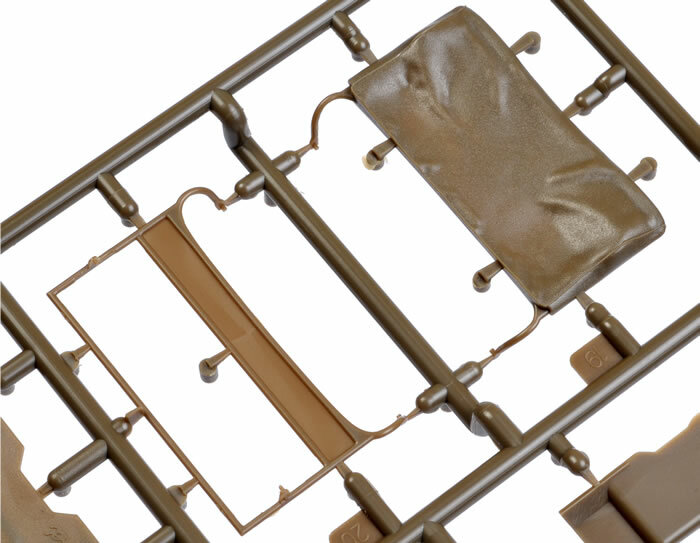 The kit has some 200 parts moulded in green plastic over 6 sprues, (with one of these in clear plastic) for the Jeep itself. 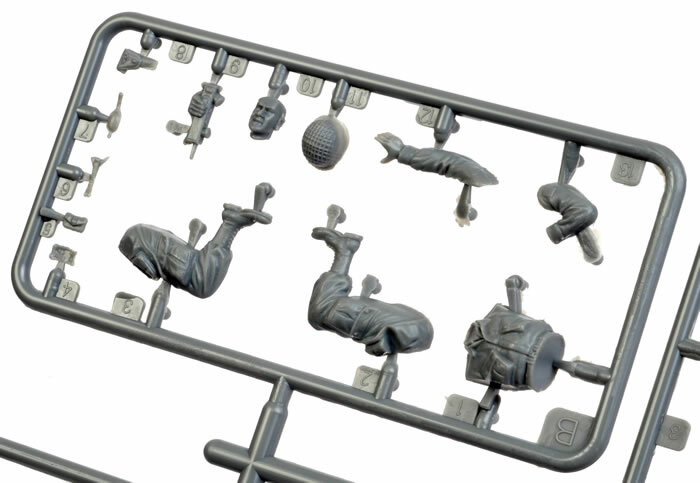 A further 100 parts are included for the trailer, accessories and figure parts. 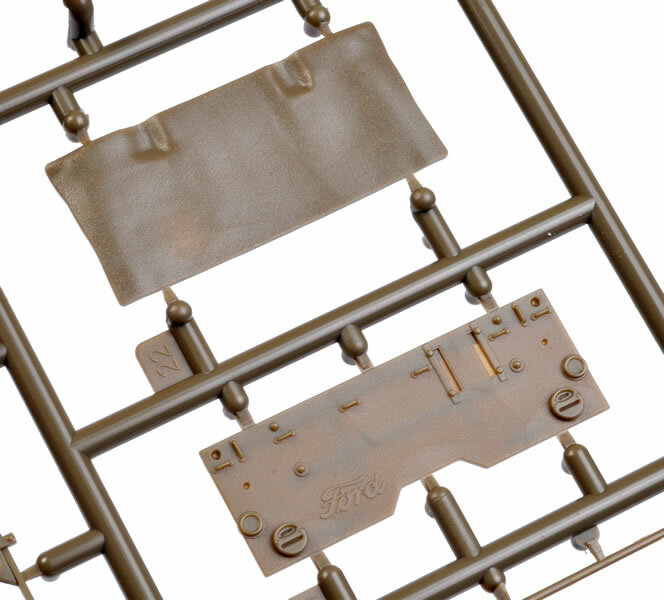 To round up, a small but very useful photo etch fret is included. 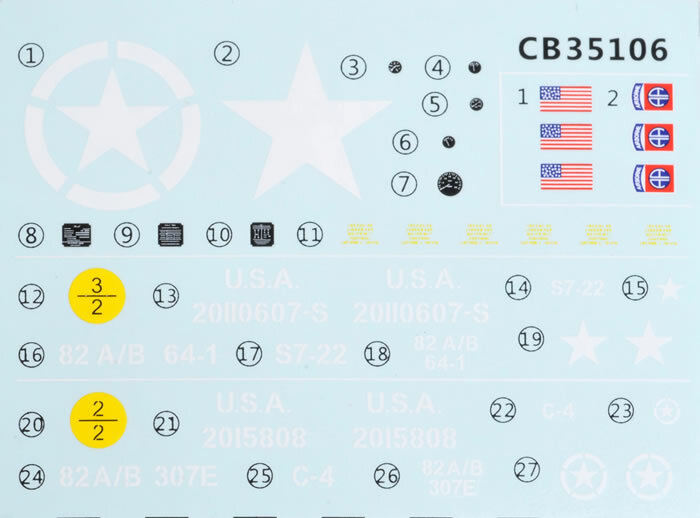 A well-illustrated and precise set of instructions is included with the option of 2 marking choices. 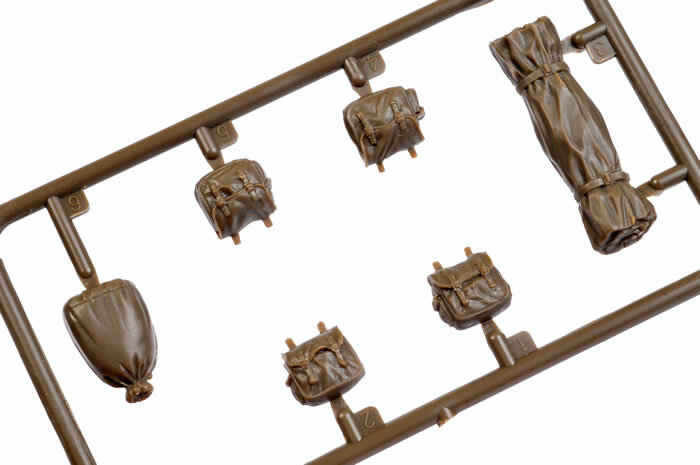 The standard of moulding is very good, with detail on all parts rendered to a high standard. 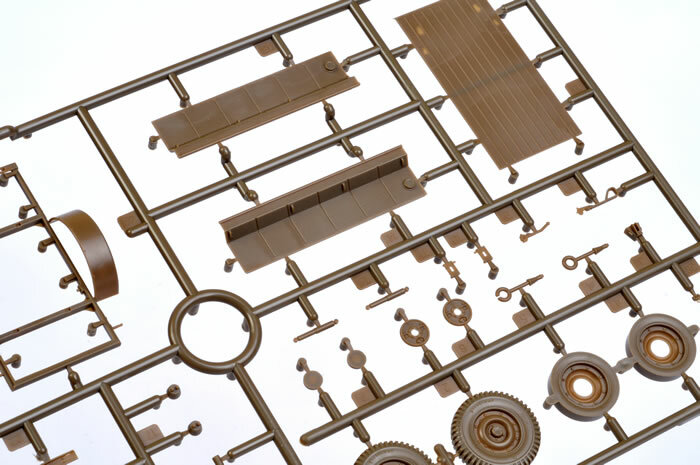 The main drive train is moulded as a multiple parts assembly and is very well done. 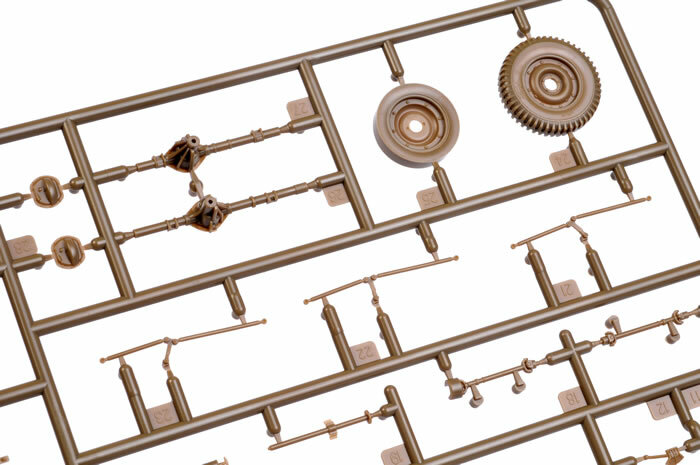 The chassis is made up of just two parts in total with the drive train axles and leaf springs attached to it. 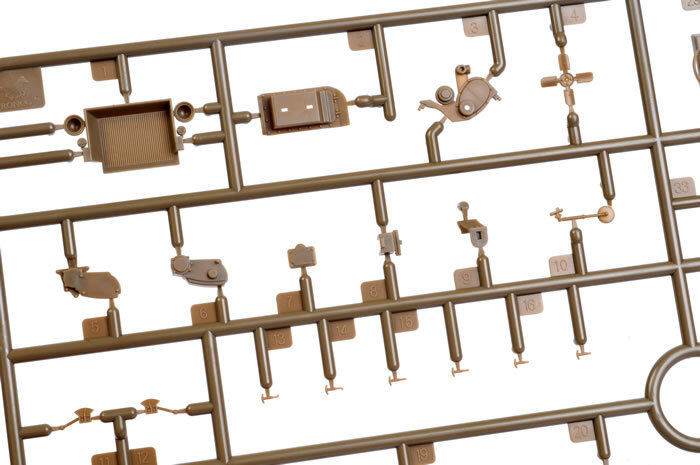 Overall this assembly is very well detailed and accurate when complete. 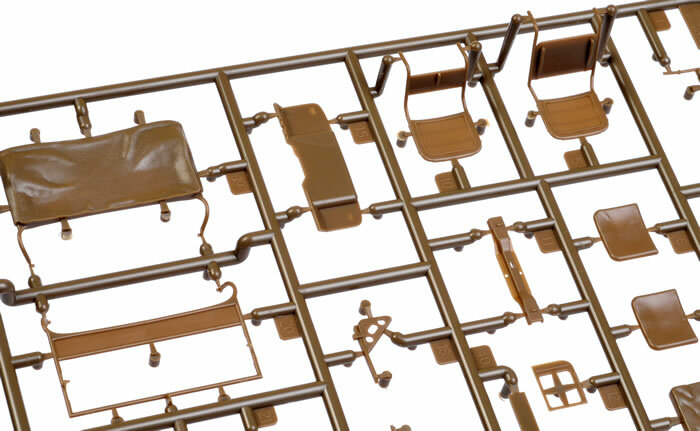 The distinctive lower coachwork and grill assembly is made up from just one part (very much like the Tamiya kit) and is very well done. 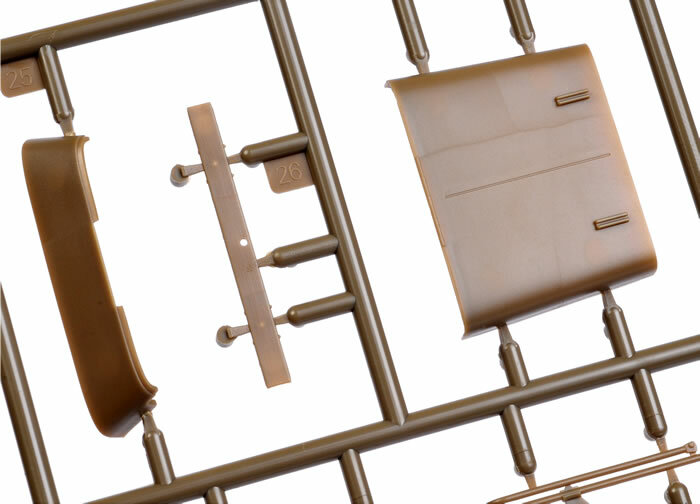 The sidewalls are little thinner than the Tamiya kit and to my eye at least, look more “in scale” in appearance. 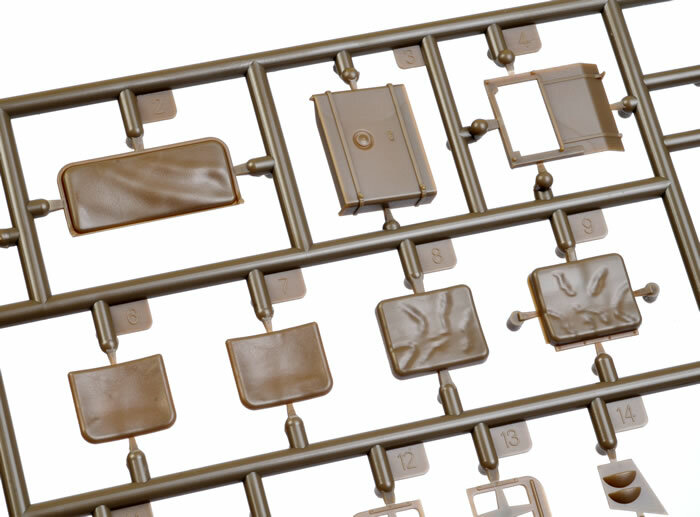 The two rear stowage compartments are moulded open, onto which the lids can be positioned in any position of your choosing. 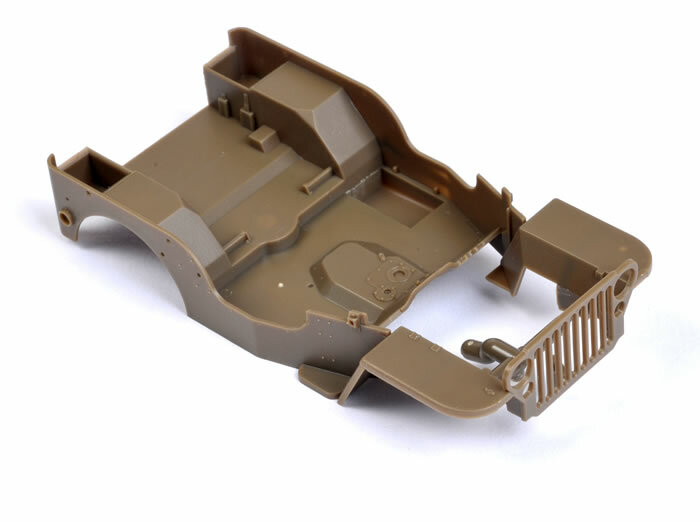 The bonnet is separate and may be modelled in the open position to expose the very well detailed engine assembly which includes a separate radiator and most of the basic parts such as separate head, manifold and carburettor. The distinctive “T” clips to hold the bonnet in place are moulded as separate (small) pieces and are very well done. 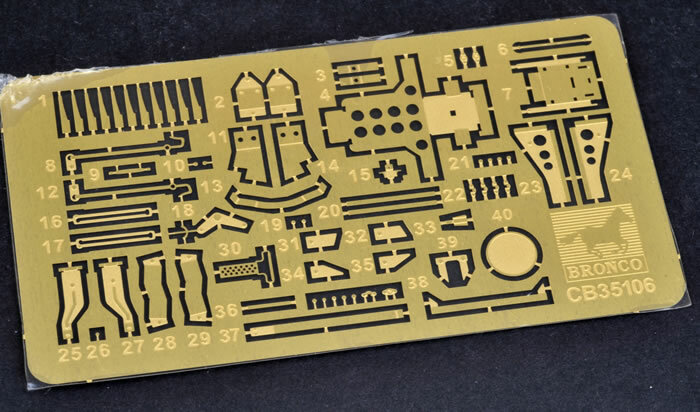 The dashboard and instrument cluster is a good representation that includes separate decals for the dial faces and instruction placement cards. 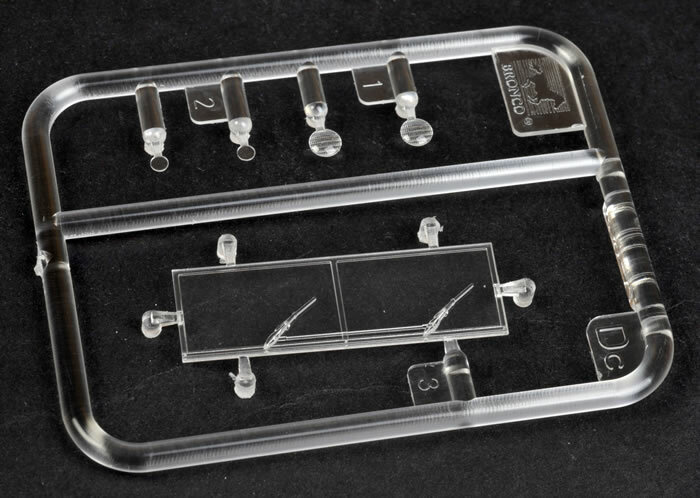 The clear windshield frames are moulded as separate parts that allow you to display the model in windscreen down or up but with the windscreen panes swung out, or lastly with just the windscreen up. This really sums up this kit - it’s all about options. Take for example the steering assembly. You can have it straight, turned to the right or turned to the left. Two types of steering wheels are provided as are three types of front bumper configurations. 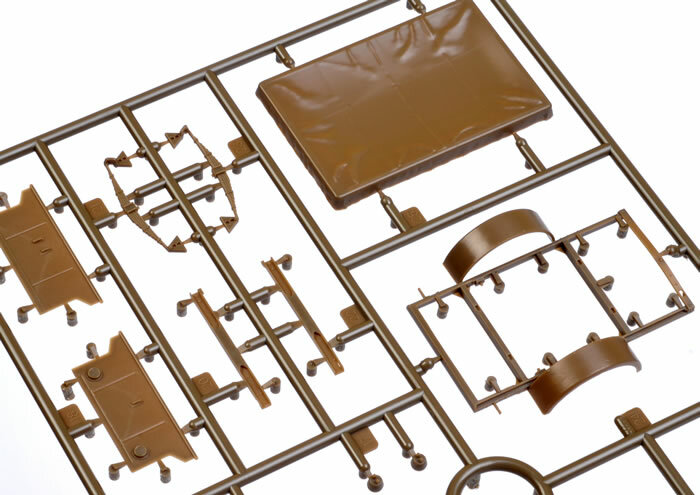 The kit provides the 10 CWT trailer and consists of some 31 parts with an option of a canvas cover, all of which is both well detailed and complete. 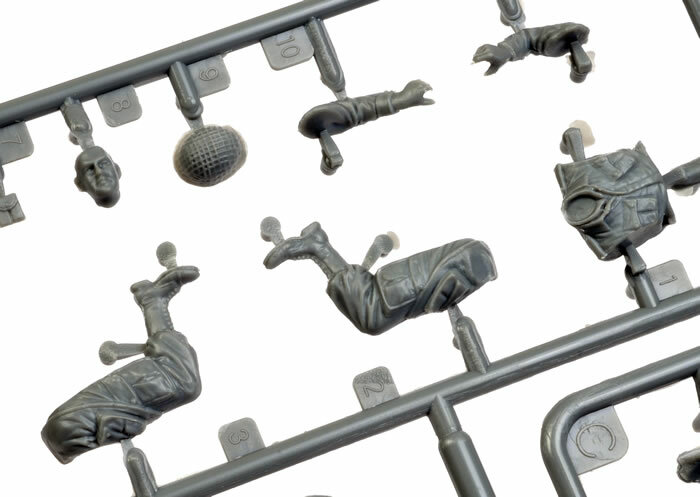 A set of three figures are included, one bearing an uncanny resemblance to the late John Wayne from the movie “The Longest Day”, and are very well done. The only real fault with these lies with the decal sheet provided. The flag decal for the right side of the arms, have, the stars out of alignment. In summary, this is a very good kit and is in my view, is better than all other kits of the Jeep that have preceded it. 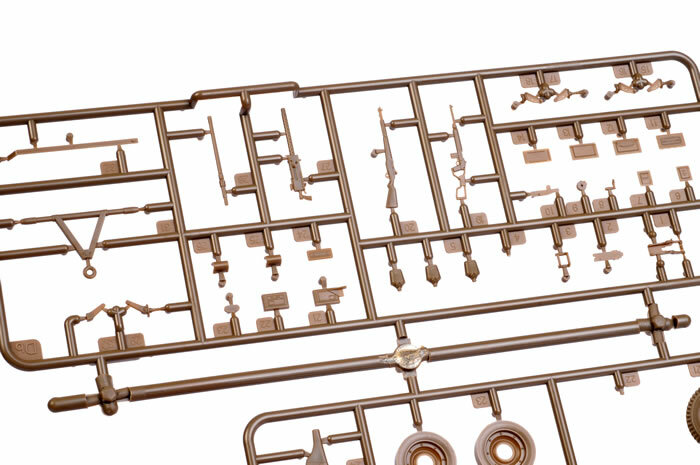 Above all, the one thing that does impress me with this kit is its overall feeling of quality. Bronco over recent years has lifted their game to such a point that they are as good as the class leaders. The model is packed with options and really needs nothing in the way of aftermarket detail sets.